After 20 years experience creating bespoke cases, many of which are complex or quirky, Victor Vorko can be relied upon to come up with inventive and original ideas to add a personal touch to his cases or accessories. Maybe you would like a case with a classical, 19th century aesthetic, or maybe a futuristic- looking « Space Age » model ? 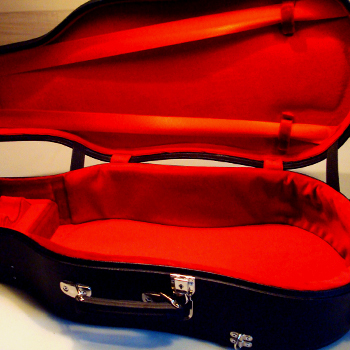 Or a case with room for all your bits and pieces ? « Impossible ! » does not seem to be in Victor Vorko’s vocabulary. 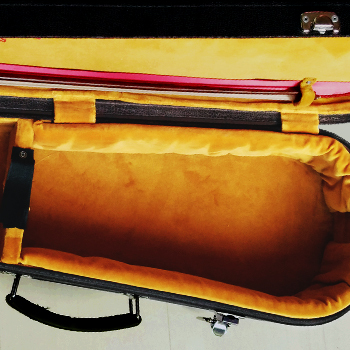 Victor Vorko’s cases are a unique marriage of the client’s wishes, a protective covering for a valuable musical instrument and a degree of knowledge which is rarely found. Victor Vorko is always ready to listen to your ideas, you can come up with your own designs for your case and he will provide a wide variety of shapes, colors, materials, accessories and finishes for you to choose from. 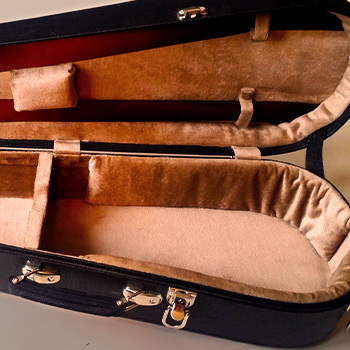 He can even, on request, add beautiful decorative touches like saddle stitching to the finished case. Victor Vorko was also specially commissioned to create a display case made of glass and wood for the Glass Museum in Sars, France. The piece contained 18 separate compartments, fashioned from glass and wood and of varying sizes, which created a fascinating interplay of color, light and shadow.